Established in 1995, software provider HT Projects offer cloud based management systems allowing their customers to keep up to date with trainees’ learning programmes. The company also provides scheduling and event management software via Site Attend, encompassing attendance, scheduling and job progress. As a small business of five employees, the company believe in investing in quality third party services. HT Project’s clients were looking for ways to improve communication and keep assessors updated with the apprentices’ training progress. The company was also looking for means to improve communications for their scheduling and management business, so employees can easily access work schedules and understand priorities. Textlocal created two-way dynamic SMS updates for both assessors and apprentices to keep them informed in real time. For example, as soon as a new document was uploaded by the assessor, the apprentice receives an SMS notification. Similarly, if apprentice completes a piece of online evidence, the assessor will receive a text. Textlocal allowed Site Attend to create and send SMS to a security workforce detailing how many employees are needed for an event, at what time and for how long. 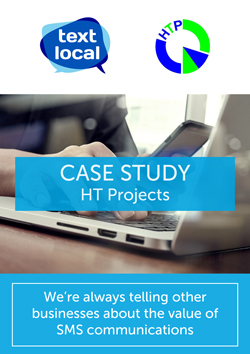 Communications vastly improved for HT Projects’ and given that assessors were being kept up to date with the progress of tasks, the quality of work was also greatly improved. Importantly to assist with Ofsted inspections, the automated SMS updates could also be used as an audit trail. The response from Site Attend’s security clients was overwhelmingly positive – employees were kept up to date in real time with opportunities and able to accept shifts simply by replying. Harry Tooley Managing Director at HT Projects Ltd.